What should you do next after deleting junk data ? We are not going to talk about how to delete the table here (also we should know how to handle related table commentmeta ). What we care about here is something we should do after deleting records from table. 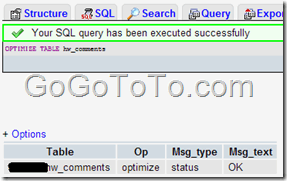 How to Release Physical Dsk Space After Deleting records from MySQL Table ? Now we go back to check the size of comments table, it is now only 8.7 kb. it is real physical space size. So now you could check your hosting account that your website database usage reduced already. Previous Previous post: Delete a WordPress Category Will Delete Posts under It ?